Local Law 11 of 2012 has ushered in a new era where technology, data, and design are used to improve the city and build up opportunities of equity. We are far from a perfect data union. The last four years have highlighted a path for us to explore. This path leads us to a door we affectionally are calling NYC School of Data. 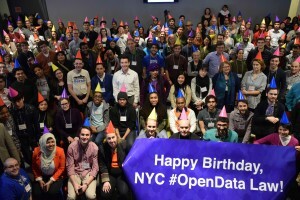 This past weekend, New York City celebrated the fourth birthday of the City’s open data law. This law is credited as the first open data law that forces agencies to proactively disclose data into a unified portal and with a functional administrative support structure around it. Through BetaNYC’s many incarnations, this is our ninth city-wide civic tech / open government annual gathering! This year’s School of Data conference was a day-long showcase of New York City’s open data ecosystem and its innovative users. Additionally, we held breakout sessions for the community to collaborate on some of NYC’s most pressing open data issues—including a data jam to address economic justice. On Saturday, 5 March 2016, New Yorkers of all stripes joined the Speaker of the City Council, the Manhattan Borough President, the Chairperson of the City Council’s Government Operations Committee, the City’s Chief Technology Officer, Board members from the NYCLU, and Code for America’s Executive Director to connect, learn, innovate, and collaborate. This weekend was a global celebration of Open Data, aka #OpenDataDay. Nationally, we celebrated Code for America’s Code Across, aka #CodeAcross. Locally, there were *two* events of note. Ours at Civic Hall, and the Rudin Center’s pioneering Staten Island Bus Hackathon at LMHQ. 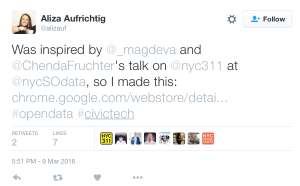 Congratulations open data comrades! Many thanks to Council Speaker Melissa Mark-Viverito for her moving words on how we need a government that is intentionally inclusive and represents everyone. Manhattan Borough President Gale A. Brewer announced the formation of a task force exploring data science & digital engagement curriculum for New York City High School students. We featured 18 sessions, 40 presenters, 22 are women, 16 came from NYC Government, & three are elected officials. 372 tickets; checked in 260+ people; 11 children under 10 y.o. attended the event. 49 people offered to volunteer. 30 labored. Eight NYC High Schoolers learned to navigate NYC’s open data portal, manipulate NYC’s 311 data, & map this data into CartoDB. Our event leadership team consisted of seven, three are women & five are people of color. 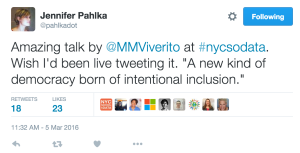 For a third of the day, our hashtag was a trending topic on Twitter — #nycSoData. Thanks to Internet Society of New York for live streaming our main stage. Via YouTube, you can tune into 7h30 of our main stage presentation. In the coming weeks, we hope to have these presentations sliced and diced. Citizen Science Session Jessie Braden, Pratt Institute, < http://bit.ly/1Sxi94A >; Eric Brelsford, 596 Acres < http://bit.ly/1pxwTFw >. In the coming week, we’ll be hosting an organizing meeting and will append these notes. Childcare is critical to diversifying attendants. Several of our speakers couldn’t attend if we didn’t offer childcare. For older children, make it explicit they can attend. Make sure you have kid friendly snacks and some type of activity for the little ones. We loved working with Sitter Studio and look forward to working with them again. We offered several admission points: $10, donate as you wish, volunteer for two hours, or scholarship. The former were done via eventbrite. The latter were organized via screendoor. We also offered “day of” tickets. In general, charging a little bit of money helped us recoop event costs AND increased turn out. In the past, free events had hovered at 50% attendance. For this event, we had over 75%. Walkie Talkies are great. Get them with ear pieces. Write up the outcomes of our Economic Data Jam. NYCLU Board Member Steven Adler has provided some of his thoughts and we have a few we want to explore in a longer post. Note, if you participated in the Economic Data Jam, please fill out this short survey. If you attended the day, please fill out our NYC School of Data Participant Survey. Our most important question, how can we improve? Lastly, we are investigating the creation of a quarterly open data / civic tech zine that documents the community’s wins and keeps the community informed. If that floats your boat, sign up for our newsletter. Aliza was inspired by NYC311’s presentation and made Chrome plug-in that shows 311 service requests against NYC apartment listings! Download the chrome plugin. 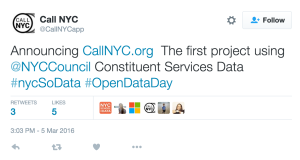 Also check out callnyc.org which profiles the City Council’s constituent service data. V.cool! Que feliz estoy to finally hear @MMViverito speak in person during @nycSOdata as a Latina trying to better NYC feel so inspired to keep on.